New-age technology is helping to create the most innovative eyewear ever. With changes to hinge, temple and bridge designs and frame materials, eyewear is becoming increasingly durable, comfortable, light and adaptable. Alternative/Plan “B” Eyewear has used innovative hinges to set them apart from the pack. “We use a 180-degree flexing hinge on our Gridiron product, which gives the wearer the added advantage of not breaking when sat upon as the flex relieves the tension that could cause the break,” says Paul Storace, CEO of Alternative/Plan “B” Eyewear. The Nano Vista collection is famous for the renowned “52” hinges. “The technology gives constant temporal pressure that hold the frame firmly on the face and at the same time flexes in 360 degrees, so making them virtually unbreakable,” says Storace. Plan “B” Eyewear’s luxury men’s line, Staag, features sunglasses with a screwless hinge. “The design relies on precision and tension to make it work. It is a must-see-to-appreciate design that feels good in motion and allows for a high-end look to a high-end collection. Staag also relies on some tried-and-true designs like the seven-barrel hinge, which makes for a classic design, look and solid structure,” says Storace. Unique hinges are also featured in WestGroupe’s fall collections. The OBE UNOFLEX hinges are “German-made hinges that are high-quality, long-lasting with precision design for maximum comfort so you can wear your frame all day comfortably,” says Beverly Suliteanu, vice-president of product development. From the Evatik fall collection, which features high-end materials and architectural design elements, style E-9177 features the OBE UNOFLEX spring hinge. This large-fit combination frame comes in hues of tortoise black, black gun and matte black grey. The OBE spring hinge is also found on the rounded rectangle shape of style F-3616. This large-fit frame comes in soft feminine shades in gradient acetate. WestGroupe is also focusing on the demand for lightweight, thinner frames. “The trend in both acetate and metals are retro-inspired thin frames that are lightweight, easy to wear, but don’t compromise style. Metal has been growing in demand over acetate,” says Suliteanu. The new KLiiK Denmark collection includes unisex frame style K-631. It is an ultra-thin profile, lightweight with a retro-round shape, featuring real leather wrapped around the metal rim. Three new releases for men, including style K-622, combine thin metal profiles with subtle pops of colour & laser-cut detailing. WestGroupe also continues to look for new and innovative ways to improve eyewear. “We use 3-D printing to ensure specs and fit on all our frames is the most accurate for maximum comfort,” says Suliteanu. Carrera by Safilo has introduced this season a new product concept within its Active collection – adjustable temples. A selection of Carrera styles have a sophisticated adjustable mechanism that gives an extreme adaptability according to face size. In addition, the frames are offered with flex hinges to offer a complete perfect fit. Providing not only comfort but also style, the extendable mechanism is exposed and clearly visible on the internal side of the temples. Styles with adjustable temples include the metal front, double-bridge 8028/S sunglasses, acetate-front 8029/S sunglasses, semi-rimless 8835 optical frame, stainless steel-front 8833 optical frames and acetate 8834 frames. The use of new technology can also be seen in the Wood collection by the Canadian design house Spectacle Eyeworks. The company is offering two new wood styles and introducing a new integrated combination of materials for eyewear. Wood weighs significantly less than other materials, such as acetate and stainless steel. “We are doing a new technology and laminating carbon fiber with wood that makes the material significantly stronger,” says Mehran Baghaie, operations director and chief designer. Two new shapes, including an iconic aviator design, along with the new generation of two existing wooden shapes, will be revamped and reinforced with the fusion of a laminated carbon fibre layer in the middle of two wooden layers. The result is the organic beauty of the wood, but with the strength and durability that is sometimes missing with standard solid wooden frames. 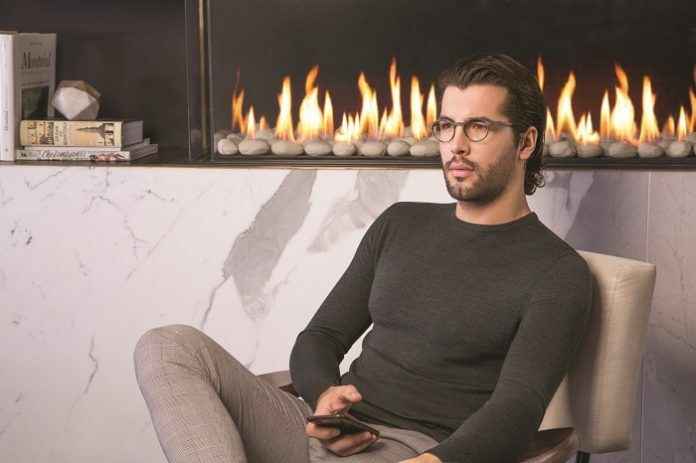 “These new frames not only meet my desire to experiment and create new and innovative designs, but also offer the wearer something beautiful yet durable enough to withstand everyday life,” says Baghaie. Ten times stronger than steel and extremely lightweight, carbon fiber, popular in aerospace and civil engineering, is now opening up new possibilities for artists and designers to achieve more expressive surfaces with lighter profiles, he says.